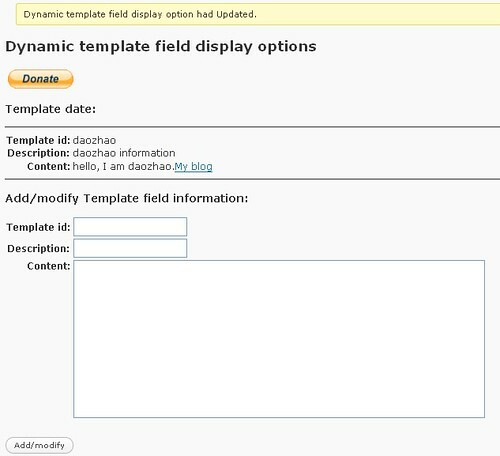 “Dynamic template field display plug-in” is a dynamic content display template. 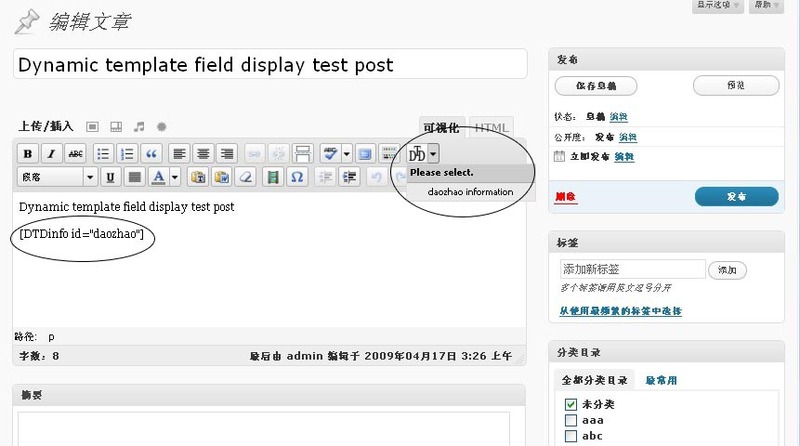 You can add more than one template, when editing the posts or page to insert templates, visual editer of an integrated device inserted in the menu button. In the article, or when the page display settings based on the template you need to replace the content of shows. You can change the template of the content at any time, and the posts or page, the dynamic of the template will be amended to show the content you need. For example, you add a template id for the “addr”. Records of your company address. When you edit an page when you need to show your company address where you insert the address “addr” in this template. 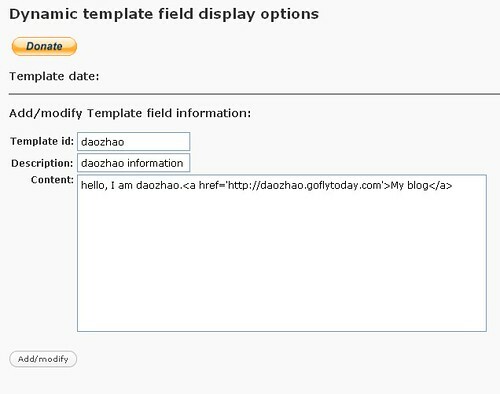 Can be entered manually, you can click on the editor from the Insert menu to insert the template. The article shows that the time will show your company address. 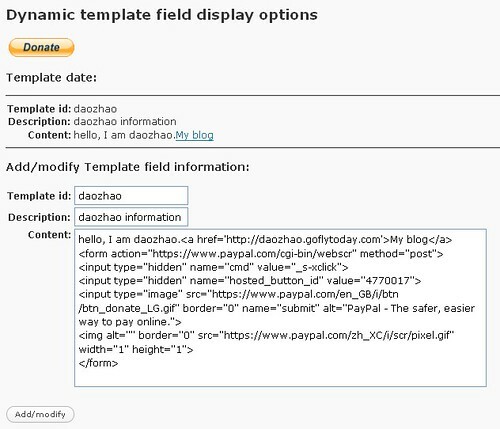 When you change the company address, you only need to modify the content of this template addr. All posts or page contain the “addr” address the contents of this template will be the new address. Can also be used to embed advertisers the contents. Add the contents of the advertisers template. Can be inserted anywhere in the posts or page. When would like to switch to other advertisers when you can simply modify the template. 1, in the settings page to add or modify your template. 2, when editing the posts or page ,you need to insert the template. 3, when the page will display the contents of your template. 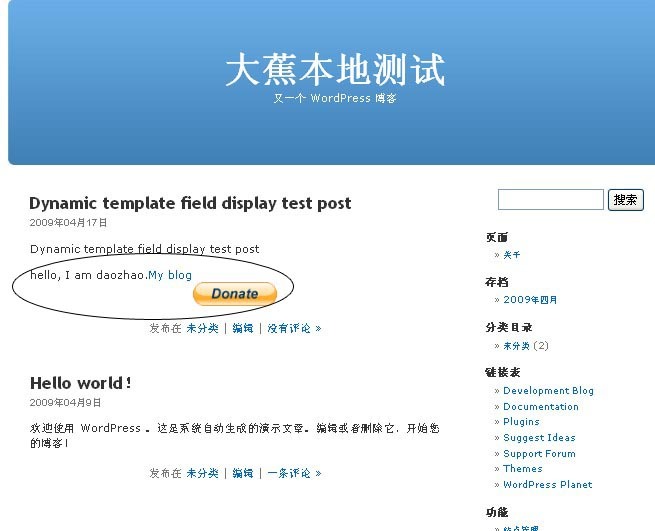 4, modify the contents of the template. 5, show your page again and find that the local changes in the template. own blog (well, almost…HaHa!) Wonderful job. I really loved what you had too say, and more than that, how you presentedd it. well, modifying the template by using the same id number and fill in all the html codes again seems to be a bit inconvenience. is it possible to have a modify button to alter the template content right on the existing one? by the way, are there any template number limits? but you cannot copy the formatting from the previous ID… eg the bold gets lost unless you find somewhere that contains the html codes. When i use them togheter the output for the plugin does not come out right. Is there any way to use these two togheter or can i just give up on this? you use same “id” to add a new template. 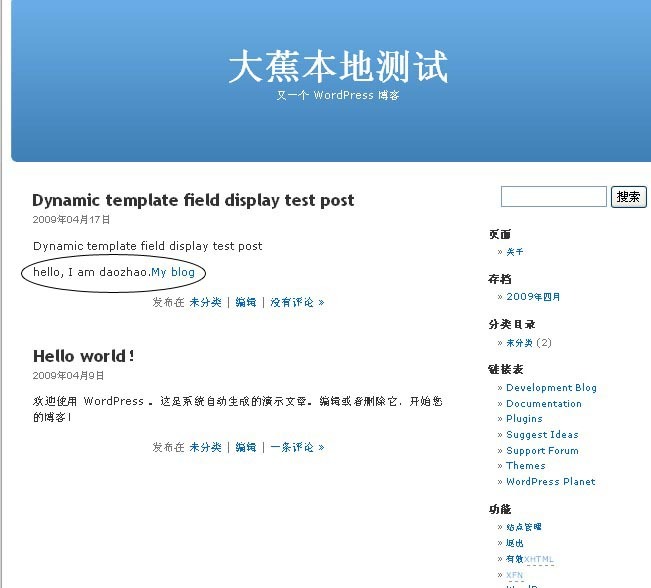 The plugin will replace the existing template. To modify the contents of an existing template, I have to RE-TYPE all the text again, including all the html formatting. Is there no way to simply change text in an existing template ?